We had a blast during Father’s Day. The kid’s prepared something cute for their daddy. 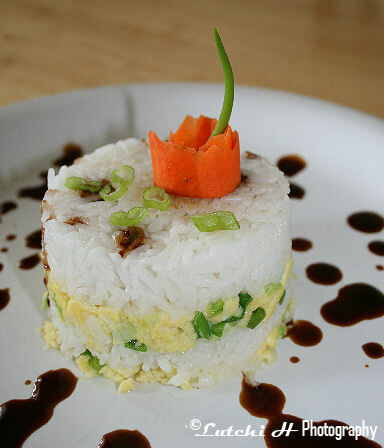 I was not really in the mood of cooking but I can’t resist on making something nice for him. We all likes Chinese food so I decided to make sweet and sour pork with Japanese fried rice and chocolate cupcakes with butter cream frosting. 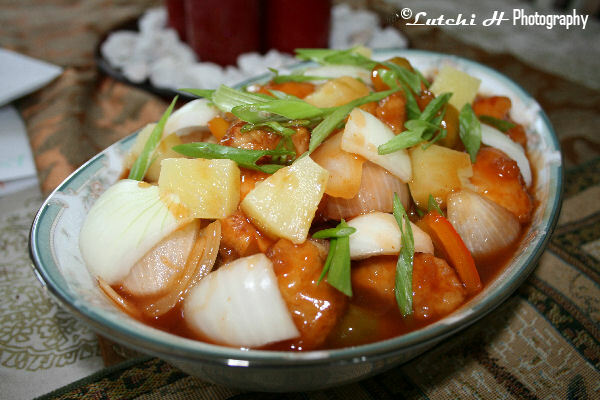 I found this sweet and sour pork recipe online long time ago. I can’t even remember where I got it. I like it better compare to other recipes all because it’s not thick and gluey. I tweaked the ingredients a bit to suit my taste. I like it when the sweetness and sourness is balance. I guess that the secret of this recipe. Combine dry ingredients in a medium bowl. Whish in cold water until combine. Add the oil and stir until smooth. Set aside. Combine all ingredients in a small bowl. TASTE TEST to suit your taste. You can always add more sugar if it’s too sour and add more vinegar if it’s too sweet. Try to balance the sourness and sweetness to get that “bang”. Set aside. 1. Heat oil in a pan or fryer to about 350 degrees F.
2. While your oil is heating. Dust pork loin cubes with the all purpose flour. 4. Remove pork pieces and transfer to a plate with paper towels. 5. Cover it with aluminum foil and place it in the oven to keep it warm. Repeat until everything has been fried. 6. In a wok (if you have any), heat a tablespoon oil, add minced garlic and scallion. 7. Stir-fry for about 30 seconds. 8. Add onions, red and green bell pepper. Stir-fry for another minute. 9. Add the sauce and bring to boil. Stir until thickened. 11. Transfer pork to serving platter and pour the sauce over the pork. 12. 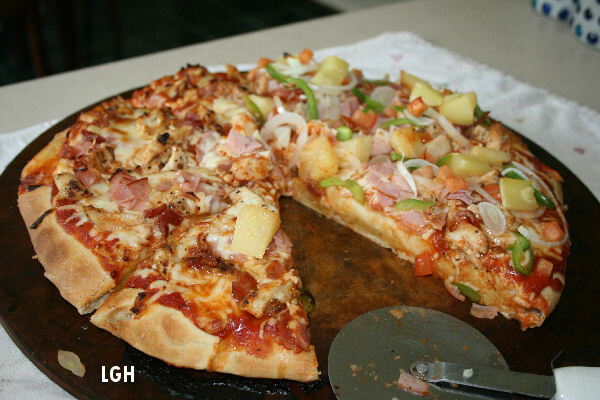 Add pineapple chunks on top. Serve hot with rice. Pizza is a long time favorite of my boy's. I am not too crazy about this food so I don't make them very often. I usually buy pizza in a box at the grocery stores or take-out. Hubby was craving for homemade pizza today so I decided to make one. I used this wonderful and easy to follow bread machine pizza dough but I tweaked the recipe a little. I have left over barbecue chicken from yesterday and three slices of bacons this morning. I used them for my toppings.You can put almost anything for your toppings so if you have any left-over’s meats in the fridge then go ahead use them. Believe me! 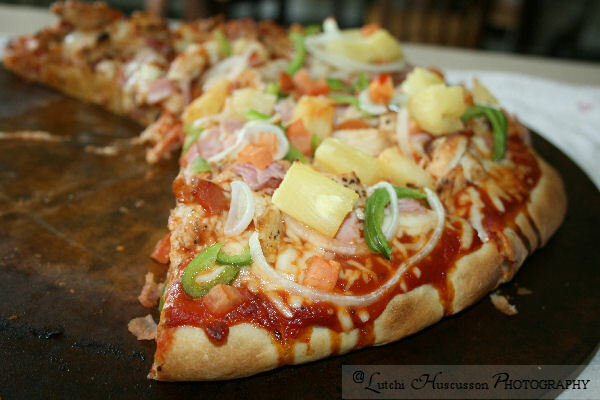 this pizza is delicious and it's one of the best pizzas you will ever have. 1 packet dry active yeast ((PROOF YEAST- in a bowl, add 1 teaspoon sugar to ¼ cup warm water (100° to 110°F). Sprinkle yeast; let stand for 10 minutes until it foams). 1. In a Bread Machine pan. Always place all the wet ingredients first, followed by dry ingredients and then yeast. 2. Place the BM pan back to the BM maker, then select the dough cycle in the menu and press start! and roll the dough around (in the bowl) thus’ coating' it in oil. 4. Cover and leave to rise in a warm place (inside the oven with light on) for about 30 minutes. 5. Knead the risen dough gently. 6. Preheat oven 450 degrees F.
7. Place the dough on well greased baking tray or pizza pan (I used my 12 inches round stone pizza pan-). 8. Roll the dough into a circle. 9. Bake the prepared pizza dough for about 10 minutes. the pizza with none of it. 1. After baking pizza dough for 10 minutes. 2. Place all the above ingredients in order I have listed. 3. Turn the oven temperature to 400 degrees F.
4. Bake Pizza for another 10 to 15 minutes or until all side is golden brown. I always grab a handful of almond cookies every time we eat out in a Chinese buffet. I always thought their cookies are so delicious. I like the sweetness and texture of it. My first attempt of baking these goodies was not very successful for some reasons. 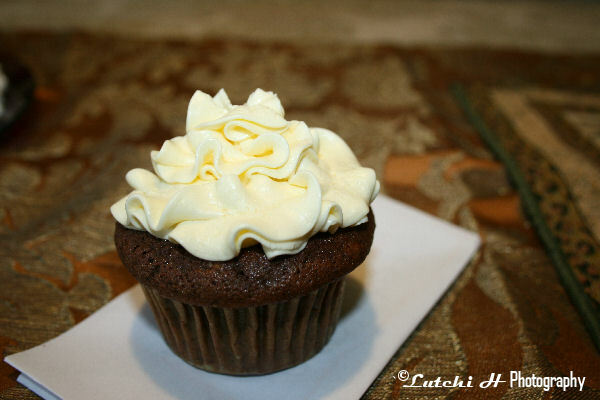 I have tried to make my second batch with a twist and it turns out really wonderful. 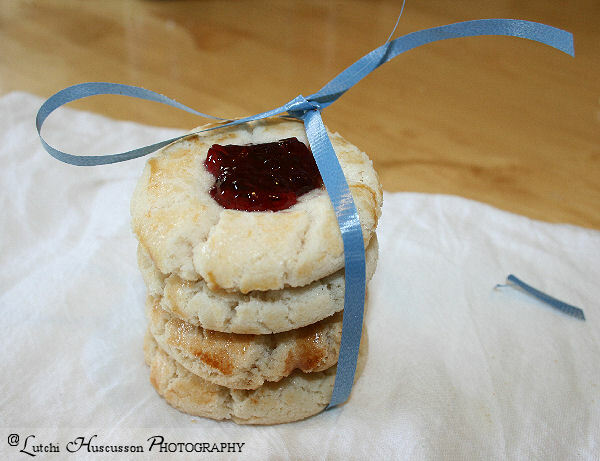 Instead of almond cookies, I turned it into thumbprint almond cookies with grape and strawberry jellies. You can put anything that you like though. 1. Pre-heat oven 350 degrees F.
2. With an electric beater, cream together the shortening and sugar until fluffy. 3. Beat egg in a small bowl, reserve one tablespoon for brushing. 5. SIFT together the flour, baking powder, and baking soda onto a wax paper. 7. Form the dough into balls (1 inch in diameter). 8. Using your thumb or index finger, make deep indentation in center of each ball (be careful not to press too hard). 9. Spoon a jelly or jam into each cookie ball (do not overfill). 10. Place them 2 inches apart on ungreased cookie sheets. 11. Get the 1 Tbsp. beaten egg that you reserved and with pastry brush, brush the top edges lightly. 11. Bake cookies about 10 -12 minutes or until slightly brown on the edges. NOTE: You can add the jelly or jam before or after cooking. I add more jelly after cooking because it was not looking right. I made these cinnamon rolls not long time ago using the ensaymada dough. It was pretty good that the platter got sparkling clean after a day. 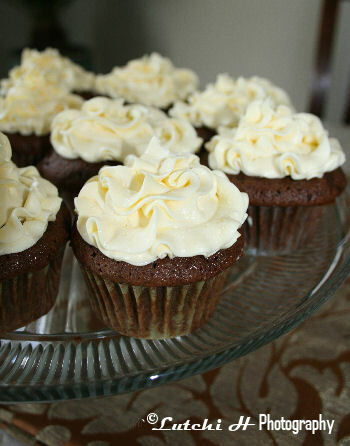 I was too lazy to prepare the sugar frosting so we eat it as it is. It was super soft and delicious. I will try to make some cinnabon next time. 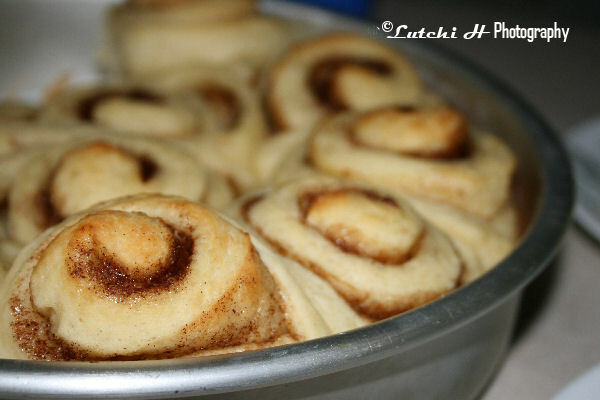 I can’t find the recipe for this cinnamon rolls, it probably buried somewhere in my files. I will post it as soon I find it. Not a very good pictures but it will guide you in preparing your first hopia baking. I made my first hopia three weeks ago. Hopia is always been one of my favorite snacks in the Philippines. It’s pretty hard to find a decent hopia around here. I watched people made them before and I found the preparation a daunty task. I did a little researched on how to make hopia and so far the recipe below is the easiest and fastest one. I adapted two recipes from Manang and starbulletin. Also, I used lard instead of vegetable oil that most people do for so many reasons. I like how the lard works in my dough. Based on my experience, it makes the crust flakier and tastier. You can buy lard almost anywhere in the grocery stores or you can make your own if you have all the time. 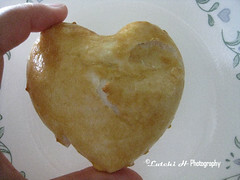 I love the onion filling of the hopia but unfortunately I didn’t find any recipe for it. I used mongo paste and ube halaya that I have prepared previously for my fillings. 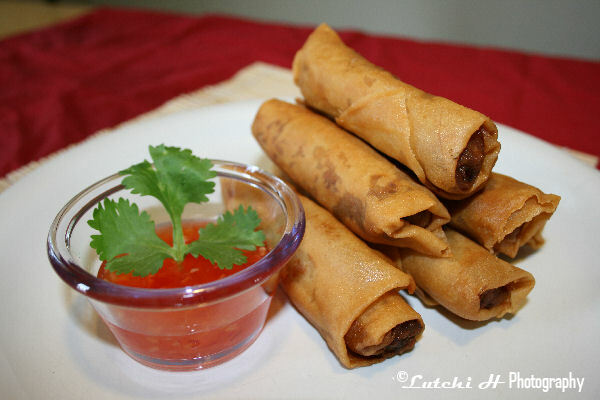 This hopia is delicious and a very easy to make, so if you’re ready to savor another childhood favorite’s then get ready and grab the lard, flour, and everything that you needed. Use your hands. Mix together until crumbly. Set aside. 1. Mix flour, sugar, and lard together until crumbly. 2. Add water slowly and form soft dough (soft but not sticky). 3. With a rolling pin. Flatten the dough onto the floured surface (1/8 inch). 4. Get the Dough 1 and distribute on top of the flatten dough 2 evenly. 5. Gently roll the two dough’s together. 6. Wrap tightly with cellophane wrap. 7. Chill for at least 30 minutes. 8. Take the dough out and cut into pieces. 1- 1 ½ inches. 9. Make sure you’re filling’s are ready. I am not going to show you how to make filling’s yet. 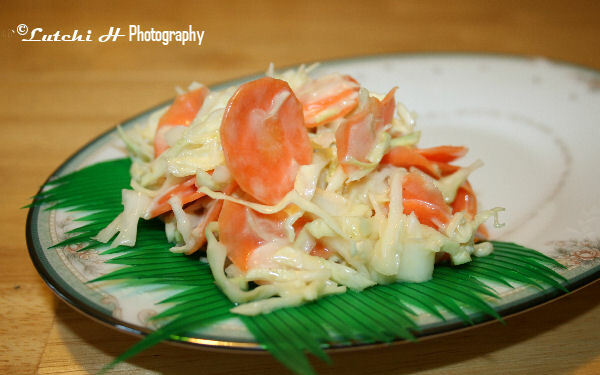 But you can use mungbean paste, red bean paste, ube halaya or anything that you can imagine. 10. Roll each piece into circle or you can shape it in anyway you want (I used rolling pin). 11. 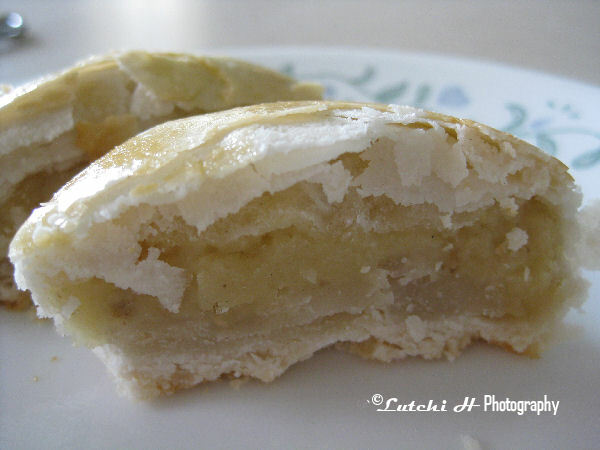 Place a heaping tablespoon of filling in the center. 12. Gather edges of dough over filling and pinch together in the center. 13. Place pinched side down. Pat into a circle and flatten slightly. 14. Repeat procedure for all pieces. 15. Place hopia on an ungreased baking pan. 16. Bake for about 15 minutes or until the bottom are brown. (NOTE: the tops of hopia will still be pale or white). 17. Remove from oven. Brush each hopia with beaten egg. 18. Set oven to broil. 19. Bake hopia for about 1-2 minutes or until hopia tops are nicely brown. (NOTE: DO NOT WONDER AROUND WHEN BROLING YOUR HOPIA to prevent burning). The kid’s and hubby were craving for some oatmeal cookies the other day. I was not really in the mood of baking but they were pretty annoying so I gave in ‘wink’. The oatmeal recipe that I used was taken from here. I made some changes to my liking for some reasons (out of all purpose flour and raisins). 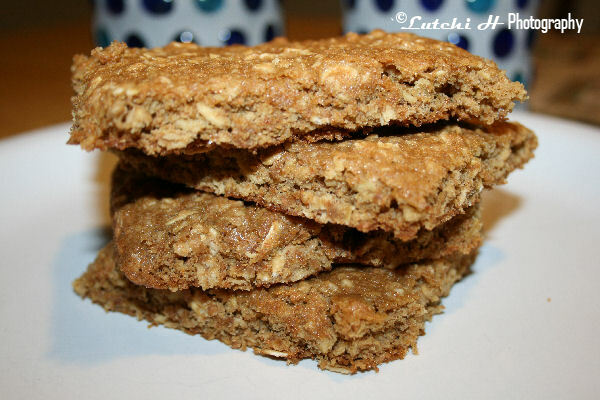 If you like your oatmeal cookies to be crunchy and crispy then this is not for you. My oatmeal is kind a chewy and soft just the way I like it. So if you’re ready for some baking then here is the recipe. 1. Heat oven to 350 degrees. Prepare greased pan. 2. Mix flour, baking powder, baking soda, cinnamon, and oatmeal in a medium bowl. 3. Beat eggs, salt and vanilla in a small bowl. 4. Mix butter, oil, and sugars in a large bowl. 5. Stir in egg mixture until smooth. 6. Stir in flour mixture. 7. Drop by rounded tablespoonfuls onto the cookie sheets. Bake until golden brown, 12 - 15 minutes, and then transfer to a wire racks (for cooling). Pan de sal? I surfed the net of its meaning and this what wikipedia said: Pandesal (Spanish: pan de sal, literally "salt bread") is a rounded bread usually eaten by Filipinos during breakfast.. It is bread made of flour, eggs, lard, yeast, sugar, and salt. It has a soft, powdery texture and is eaten in a number of ways combined with numerous sandwich spreads. It is also used for dipping into tsokolate (chocolate), a chocolate drink very much like hot chocolate but with pure cocoa as its main ingredient. 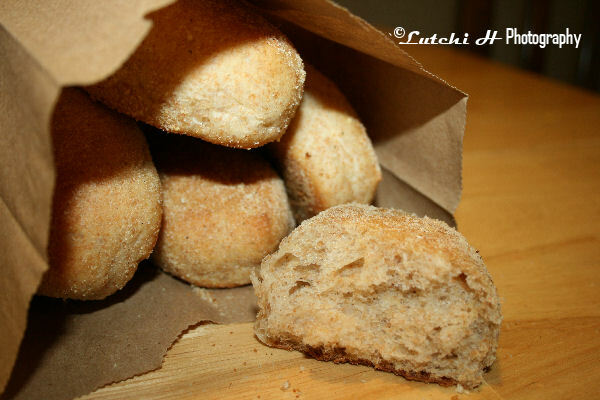 Despite the literal meaning of its name, the taste of pandesal varies from bland to slightly sweet. It usually costs one Peso (about 4 cents U.S.), with larger varieties costing 2 Pesos. The last time I had Pandesal was three years ago when I visited the Philippines. This bread is always one of my favorite breads. 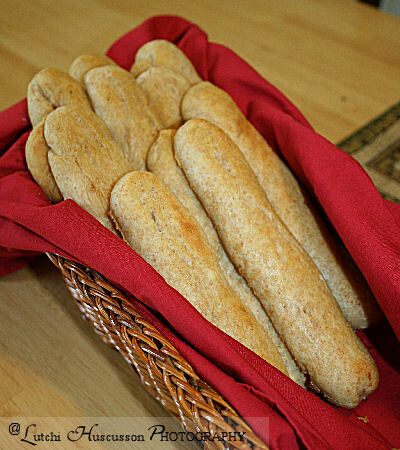 It is the most popular bread in the Philippines. I grew up in a place that surrounded by bakeries so I never learn how to make it. Pandesal that just came out from the oven is always the best. I like it with butter, margarine, corn beef or just plain. Oh! I made my very first pan de sal using bread machine for the dough. I just love my BM to the mixing, kneading and rising. It’s a lot faster, less messy and convenient for me. I have all kind of pandesal recipes but because I don’t have most of the needed ingredients, I did the tweaking once again and came out with this recipe. PROOF YEAST- in a bowl, add 1 teaspoon sugar to ¼ cup warm water (100° to 110°F). Sprinkle yeast; let stand for 10 minutes until it foams. 1. Add ingredients to bread machine pan following the manufacturer suggestion. 2. Set the bread machine to dough cycle and press start. 3. Wait for the dough cycle to complete. It took me at least 1 hour to 30 minutes. 4. When the dough is ready. Unplug your BM and take the pan out. 5. Grease your hand with cooking oil. 6. Punch the dough down until it deflates. 7. Lay the dough on the prepared greased surface and stretch to make a log. 8. Squeeze the dough gently to release some trapped air. 9. Cut the log into two and sprinkle it with bread crumbs. I used Italian bread crumbs. 10. Using a dough cutter, cut logs into pieces (1 to 1-½ inches). 11. Roll each piece to bread crumbs to coat all sides. 12. Place pieces on greased (I used olive cooking spray) baking pan, with the cut side up 1 inch apart. 13. Cover with clean damp cloth and put it inside the oven with the light on. Let it rise for about 30 minutes. 15. Preheat the oven to 350 degrees F.
16. Bake for 12 minutes or until golden brown. 17. Let Cool and enjoy with your favorite fillings. I made 18 pieces of Pandesal. It was crunchy in the outside and soft in the inside. .At first, I never thought its going to work out because I was not using BM yeast and all bread flour but hey! It turns out really good, more than I expected. The recipe was very easy and fast. Just follow the steps and you will have a delicious and healthy pandesal in no time.